Easter week (Semana Santa in spanish) is the busiest holiday time in Mazatlán and all of Mexico. Easter is a catholic holiday. Most Mexicans will get a few days to a complete week off of work to celebrate. It is common for millions of Mexicans that live inland to head to beach resorts, including Mazatlán. The population of Mazatlán almost doubles during this time. People will visit their relatives and fill every hotel room in the entire city! 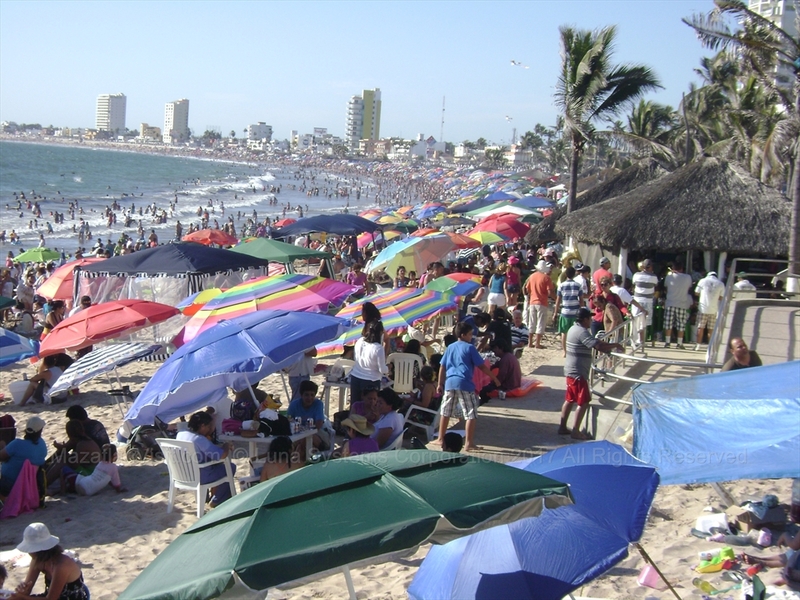 The entire week prior to Easter Sunday is busy in Mazatlán. The peak period is from the Thursday prior to Easter Sunday through Easter Sunday. If you don't like crowds and traffic we recommend that you don't visit Mazatlán during Easter week. For miles the beach is so full that if you look down on it you would not even see the sand! Also, prices are generally higher during Easter Week. As mentioned, traffic is terrible and some years the city institutes one way traffic north on Avenida Camaron Sabalo in the Golden Zone. This makes traffic terrrible if you have to head south. Taxis will charge more as they have to go far out of their way. In 2019, Easter Sunday is April 21, 2019 so the week prior to this date is when everyone in Mexico celebrates Easter (semana santa). It will be especially busy in Mazatlán on the Thursday (Apr 18), Fri (Apr 19), Sat (Apr 20) and Easter Sunday(Apr 21)!